Don’t Miss the Chance for Substantial Savings with the Federal R&D Tax Credit! Also known as the credit for increasing research activities, the Research and Development (R&D) Tax Credit is one of the most lucrative yet underutilized incentives in the tax code. Each year, large corporations save billions of dollars through the federal R&D Credit, while many small and mid-sized businesses wrongly assume that they are not eligible. In reality, businesses of all sizes in a variety of industries routinely have qualifying expenditures under the R&D Tax Credit. The business engaged in an activity with the goal of creating new or improving the existing functionality of a business component, such as a product, process, or software. The business intended to eliminate uncertainty about the activity, such as the optimal method of completing it. In attempting to eliminate the uncertainty, the business conducted a process of experimentation that evaluated one or more alternatives. The process of experimentation was technological in nature and relied on the physical or biological sciences, engineering, or computer science. To qualify for the R&D Credit, businesses do not need to create something brand new and revolutionary—they simply must develop a product or process that is new or represents an improvement for their business. Business taxpayers in a wide array of industries, including architecture, engineering, and manufacturing, regularly conduct activities that may be eligible for the R&D Credit. For example, Capital Review Group recently worked with a mid-sized engineering firm to maximize tax savings under this incentive. Based on the firm’s activities, such as evaluating different design concepts, creating plans for environmentally friendly buildings, and navigating complex building codes, the tax experts at CRG were able to help the firm claim up to $152,000 in federal R&D tax credits and up to $234,000 in state R&D credits. See our R&D Case Study here. In addition to the opportunity for substantial savings in the current tax year, the R&D Credit features a carry-back period of up to three years and a carry-forward period of up to 20 years. As a result, CRG advised the engineering firm to apply excess credits to previous tax years. Under the Protecting Americans from Tax Hikes (PATH) Act of 2015, the R&D Credit was permanently added to the tax code and expanded to allow certain smaller and newer businesses to apply for the credit against their payroll and alternative minimum tax (AMT) liabilities. Therefore, now is the time for businesses of all sizes to significantly reduce their tax burdens with this valuable incentive! Wondering if your business qualifies for the R&D Tax Credit? 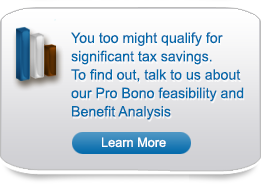 Contact CRG today at 877-666-5539 to schedule a pro bono analysis!